Our guide to Opening Weekend at the Castle! The Castle Community team is thrilled to announce that construction on the project will begin in early July with an anticipated opening in late November. Benike Construction has been hired as the general contractor for the project under the direction of Mike Benike. Benike’s experience with historic buildings (notably the Conley Maass Downs building on Fourth Street SW) greatly impacted our decision to work with their team. Follow Castle Community on Facebook and Instagram for updates over the course of construction. We are delighted to introduce the chef/owner/operator of our first floor restaurant and exclusive caterer for all events in the building, Zach Ohly with Cameo at the Castle. Cameo will be popping up around Rochester in the coming months to give the community a taste of what to expect when the restaurant opens. Until then, stay tuned… and stay hungry! The Castle Commons is the common area between the Fair Trade Books and the Castle Studios. The space will be open to the public during the hours of operation of the building. We intend for the Commons to be a unique indoor space for the citizens of Rochester to use and enjoy as they please. The space will provide tables & chairs, soft seating, wireless internet access, games, books, magazines, and additional amenities to be determined. Cameo will offer coffee, snacks, and food for purchase, and outside food and beverage will be allowed in this space. The Commons is intended to bring together Rochester residents and visitors into an open and inviting space to work, learn, and congregate. Fair Trade Books first opened its doors in Red Wing in early 2014 and now plans to open a second location on the second floor of The Castle in Downtown Rochester. The store sells new and used books as well as vinyl records, comics, and games. Much more than a bookstore, Fair Trade Books will host events such as author signings, topical films, lectures, game nights, and more. The Castle Arts Community will offer private art studios for rent, group studio space, a traditional photography dark room, a makerspace, a gallery with rotating exhibitions, and additional resources to the arts community in Rochester. Artists will work in a community-focused atmosphere, providing an environment for collaboration and engagement with other creatives and the community at large. Artists will work together to guide the programming of the artistic spaces. The Art Store will offer original artwork for purchase (in collaboration with the Castle Arts Community), art materials, handmade gift items, and a space for local makers to present a pop-up retail showcase. The Art Store will also feature an “art bar” where patrons can create an original work of art with supplied materials and instruction from staff. The third floor event space will host a variety of community events. It has the capacity to function as a banquet or conference facility, entertainment venue (hosting lectures, musicians, film screenings, and other performing arts). This space will serve local musicians, cultural initiatives, large gatherings, business meetings, and other special events. We are currently booking for 2018 holiday events and the 2019 calendar year. 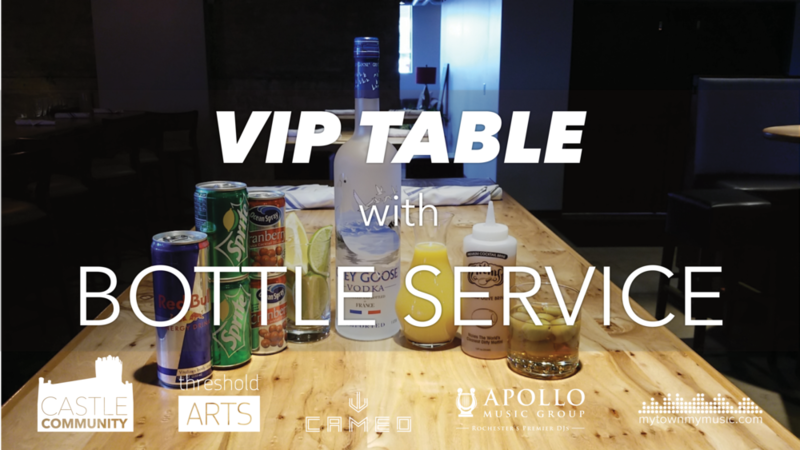 Cameo will support any food and beverage needs for events in this space, offering full-service catering, bar service with a modified food menu, and box lunch options for groups of all sizes. The art gallery will showcase the work of local artists and traveling exhibitions under the direction of the Castle Arts Community. Exhibitions will change on a regular basis (6-8 weeks), offering a new experience for visitors on return visits. The space will also be available for private functions. The community meeting space will be available for community members to use free of charge, based on availability. The Castle Arts Community and Fair Trade Books will also use this space to offer classes, workshops, artist lectures, author events, etc… Reservations for this space can be arranged with the Castle Arts Community staff. We are eager to welcome the community into this space and look forward to opportunities for connect with you. Stay tuned for upcoming events and announcements about the project. Please visit our website for more information, and contact us with any inquiries regarding artist opportunities, event space, or collaboration with our team. Eric Deutsch was born and raised in Rochester. He graduated from Lourde High School in 2002 and furthered his education at the University of Notre Dame where earned both bachelor's and master’s degrees in accounting. Eric worked for two years in public accounting in Phoenix, AZ before returning to Rochester to join his third generation family business, Pace International. In addition to his role at Pace, Eric is the CFO and co-founder of Imawhale LLC which is a poker staking company out of Las Vegas. He is also active in the real estate market in Rochester. Eric is married to Deanna and they have two children, Allison and Owen. Ross Henderson was raised in Rochester. He graduated from Rochester John Marshall High School, Class of 2000. He is a real estate professional by trade. Ross is commercial property manager for the properties he owns around Rochester. Ross was a founding member of C4 (Concerned Citizens for a Creative Community) Arts Group and continues to support the arts community in Rochester. Ross is the owner of Henderson Investments, which owns Centerville Apartments, which is located directly South of the Armory. Scott Hoss a real estate professional by trade. He graduated from Rochester John Marshall High School, Class of 1991. Commercial real estate sales, leasing, and property management are his main areas of expertise. Scott practiced as an attorney at Dunlap & Seeger PA for seven years before pursuing a career in Commercial Real Estate. Scott is a commercial property manager and shareholder in Paramark Real Estate Services, a property management company. Scott is an avid traveler. In his travels, Scott has identified a variety of community spaces that attract community, tourists, and artisans to activate it. Some of the inspiration for the Castle Community comes from his travels to Union Station in Denver, Colorado, SCAD (Savannah College of Art and Design) in Savannah, Georgia, Northeast Minneapolis (i.e. Northrup King Building), and a variety of spaces in the Pacific Northwest. Leyzer Topel is a Venezuelan citizen. His father first brought his family to Rochester in the early 1980s while his sister was being treated by Dr. Peter James Dyck at the Mayo Clinic. Ever since then, Rochester has been an integral part of his life. Leyzer has owned and developed properties in Rochester such as Zick Apartments; The Lofts on 1st Street SW between 6th and 7th Avenues; Clinic Suites on 3rd Avenue SE; and the 105 North Broadway building which he remodeled as an assisted living facility and is now leased to Prime Time Living. He has recently purchased a home in the Fox Hill neighborhood with his wife and four children. Leyzer plans to spend more time in Rochester as the turmoil in Venezuela continues. Leyzer is a grand supporter of the arts. He is also an art collector and presides over a private art museum owned by his family which holds a collection of Latin American, opt art, and drawings. The museum holds, every two years, one of the most prestigious art exhibits in Venezuela, the Arturo Michelena art prize. Naura Anderson is a creative professional with more than a decade of experience in the local arts community. She grew up in Southeast Minnesota, studied Studio Art at St. Olaf College, and from 2006-2015 worked for Rochester Art Center. During her time at RAC, Anderson served in a variety of program and administrative roles including: museum store management, arts education, public programming, special events, community engagement, publications, and curatorial work. She currently runs an arts consulting business, providing marketing support, graphic and web design services, and arts programming for local nonprofit organizations, artists, entrepreneurs, and community groups. Anderson will manage special events and arts programming for The Castle. She will also operate the The Art Store on the second floor of the building. Rick DeVoe is the owner of Fair Trade Books in Red Wing, MN which opened in 2014. Much more than a book store, Fair Trade is rapidly becoming the place to go in Red Wing for community. Between the open mic nights, meet the author events, and his continuous promotion of other area businesses, Rick has already made an impact! He is enthused about partnering with artists in The Castle. The indoor commons on the same level is particularly appealing to him, as he believes it will be to Rochester residents and visitors alike. Zach Ohly has been cooking professionally for over 14 years. Since his first job as a prep cook at Famous Dave’s Duluth when he was 18, to working at Thomas Keller’s world renowned French Laundry in Yountville, California, Zach has been pursuing excellence in his craft at each stop along the way. He honed his culinary skills at restaurants in Minneapolis, St. Paul, Denver, San Francisco Bay Area, and finally returned to his hometown of Rochester. He is currently the Catering Chef for Morrison Healthcare at Mayo Clinic and prior to that he was the Executive Chef at Pescara Restaurant in the Doubletree Hotel. This concept is a passion project for Ohly, and along with his team which includes Danika Ohly (FoH and Special Events), Kiefer Manning (General Manager and Sommelier), and Aynsley Jones (Beverage Program) will bring an entirely new type of dining experience to Rochester with Cameo. What's the right use for the Armory?